Clint Eastwood is not exactly a sure-fire bet as a director. Since striking sweet, sweet Oscar gold with 1992’s instantly iconic western Unforgiven, his output has often sling-shotted wildly back-and-forth in quality, from high grade populist art to bloated, unremarkable awards bait. While the former Man with No Name appears unconquerable on-screen, behind the camera that just ain’t the case. He has a notorious Achilles’ heel for poor scripts, and is known to race headlong into production with first draft efforts. That’s all fine and dandy if he’s holding Million Dollar Baby or Letters from Iwo Jima under his arm. But hand him Midnight in the Garden of Good or Evil or Changeling and things get uglier than the last act of a Dirty Harry thriller. Sad as it is to report, his latest, the star-studded J. Edgar, lands with a hollow thud in the sorry latter category. 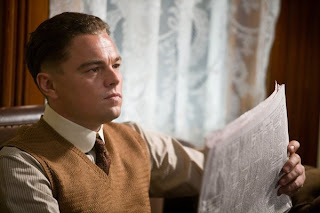 Starring Leonardo DiCaprio as Hoover, the legendary FBI first director, the film falls prey to almost every damning pitfall of the biopic genre. Meandering, underbaked, and almost entirely devoid of depth or emotion, Eastwood’s movie plays less like a cinematic narrative than an exhausting series of historical “greatest hits” moments stretched over a punishing 135 mins. I’ll be utterly gobsmacked if there’s a more tedious prestige picture this year. Unspooling in pointlessly jumbled chronology, J. Edgar loosely traces its subject from his earliest days as an eager young agent in the 20s, feverishly trying to pin down convoluted Bolshevik conspiracies, to his lonely final days five decades later, sternly recounting his autobiography to a series of interchangeable typists. The film skips over the oft-covered gangster wars of the Depression, instead primarily using the Lindbergh kidnapping as a means of recounting Hoover’s obsessive personal quest to improve methods of evidence retrieval and to establish a fingerprint database. His visionary ideas transform the Bureau of Investigation from a dead-end organization into the top crime-fighting agency in the world, in the process elevating J. Edgar to an untouchable status enjoyed by precious few. 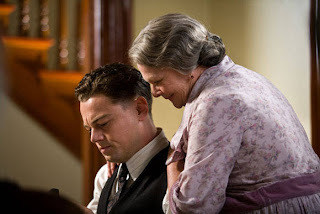 Although the details of Hoover’s personal life are sketchy at best, Eastwood’s film paints him as a socially inept loner, clinging to the apron strings of his dominating mother Anna Marie (Judi Dench) for much of his life. He has only two other confidents: loyal secretary Helen Gandy (Naomi Watts) and second-in-command Clyde Tolson (Armie Hammer). Tolson, the movie argues, was also Hoover’s clandestine lover, a man of infinite patience who spent an inordinate amount of social time with his high maintenance superior. Undeniably, there are multiple nuggets for a fascinating motion picture strewn throughout J. Edgar. However, the script by Dustin Lance Black – who previously penned an infinitely better biopic with 2008’s Milk – jumps around too much to gain any momentum. This film desperately lacks a coherent throughline; it’s a confusing series of half-formed ideas, grafted onto a flimsy narrative structure, that never bond into anything substantial. There’s no drama to this story, only exposition, dull minutiae and bloodless recreation. No concrete reason to care about Hoover’s (heavily fictionalized) on-screen life or his valuable achievements. There’s a brief tantalizing bit where a supporting character references J. Edgar’s aggressive, and extremely successful, tactics for rewriting his and the FBI’s role in popular culture through comic books and movies. Couldn’t Eastwood have cut out a handful of dreary sequences of Hoover dictating his life-story and fleshed out fascinating material like that?! It must be said, DiCaprio delivers another boldly effective performance. Speaking in a contemplative, precise drawl that ejects every word like the clack of typewriter keys, he’s calculated and icily internal, greeting his closest colleagues with all the affection of a computer. Even when he’s buried under a liberal slathering of slightly rubbery old age makeup, the actor manages to bring more to this enigmatic, insecure and unlikable character than the movie frankly deserves. 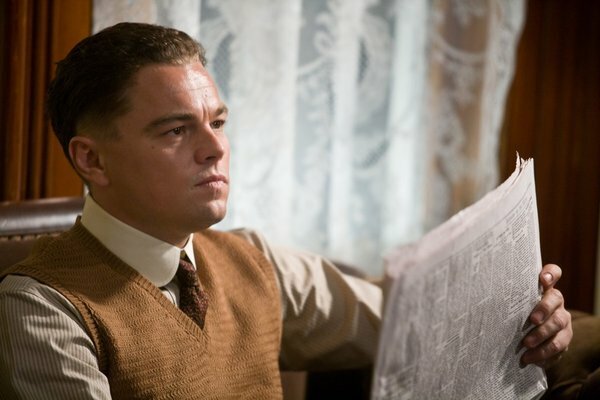 In a better film – one that figured out how to make J. Edgar interesting – DiCaprio would be an easy lock for a Best Actor nomination. The character of Hoover could have been explored more satisfyingly if the picture hadn’t short-changed the key players surrounding him. Armie Hammer has a genuinely strong presence, but his Clyde Tolson is an utter blank. It’s nearly impossible to name any characteristics that describe his personality beyond “loyal.” Like Naomi Watts’ underutilized secretary, he’s just there for DiCaprio to bounce lines off of – a limited function which proves disastrous in the love story-heavy second half. On the flip side of the equation, Judi Dench brings lioness-like severity to her role as Mama Hoover, and owns the film’s single best scene, bitterly recalling one of J. Edgar’s homosexual childhood classmates. However, despite her alleged impact of her son’s life, she receives depressingly little screen time. Eastwood may not be able to breathe any storytelling life into J. Edgar, but he’s certainly fashioned a beautiful looking dud. He and his frequent cinematographer Tom Stern return to the chilly deep black and silver colour palette of Flags of Their Fathers, elegantly complementing the period costumes and sets, and imbuing the movie with a handsome noirish atmosphere. It’s fitting that Hoover, a man of a thousand secrets, always seems to have his face partially concealed by shadows. 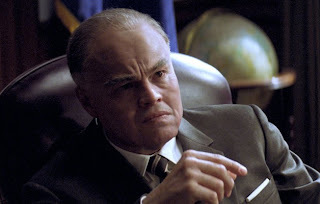 At one point, J. Edgar says “What’s important at this time is to re-clarify the difference between hero and villain.” It’s a powerful statement, and one that should be loaded with rich subtextual meaning. There are intriguing parallels between Hoover’s tale and our own turbulent times and one can’t help but wish a bolder, riskier filmmaker than Eastwood had been able to sink their teeth into this story. Maybe then we’d leave the theatre deep in conversation instead of stifling yawns of indifference.